This is Super Cool ! If you play these deck-building games this is a must have. 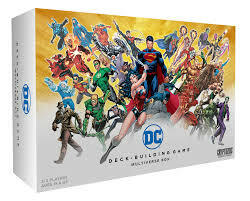 The DC Deck-Building Game: Multiverse Box is a storage solution for one box to house every DC Deck-Building Game card, featuring customizable trays, spacers, and a Crossover Pack of brand new cards! These new cards allow for each previous DC Deck-Building Game to be used together in one game.